1. Start by soaking your beautiful green lentils in water while you dice up all of your veggies. 2. While your lentils are soaking in the water, chop up your carrots, celery, garlic, onion and leek. 3. Once all your veggies are chopped, heat up the olive oil in a stock pot over medium high heat and add the diced veggies. Cook just until the the onion and garlic softens, about 7 minutes or so. 4. While your veggies are cooking, chop up your kale and get it ready to go, but don't add it yet. You don't need to worry about chopping the spinach leaves, when it comes time to add them, just use the whole leaf. 5. Once your veggies are cooked, drain your lentils and add them and the rice to the veggies. If you can't find a black rice, just use wild rice. 6. 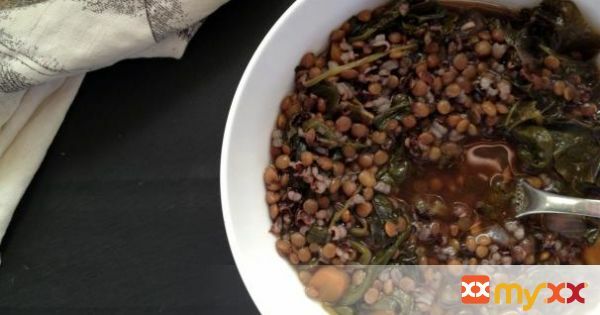 Give the veggies, rice and lentils a stir and then add your veggie broth, water, kale, spinach and all of the spices and turn the heat to high. 7. Keep the burner on high just until the soup boils, reduce the heat to low and cover for 25 minutes. Covering the soup will ensure that the lentils and rice cook thoroughly. 8. After the soup cooks covered for 25 minutes, remove the cover and continue to cook on low for another 30 minutes or so. I added another 1/2 tsp of salt and a bit of pepper for flavoring at this point and it was a perfect balance. 9. After the final 30 minutes of simmer, simply serve and enjoy!